View of “Kerry Tribe: The Loste Note,” 2014. This backstory reframes the sculptures, allowing them to be read as practical objects, “things,” abstracted and bent toward poetry. Two sets of silk-screen prints hang opposite each other: Stroop color word test / Moondust, a simple set of mismatched color words used to detect brain damage, and Is Popcorn Alive?, another cognitive diagnostic tool—here reframed as text art. 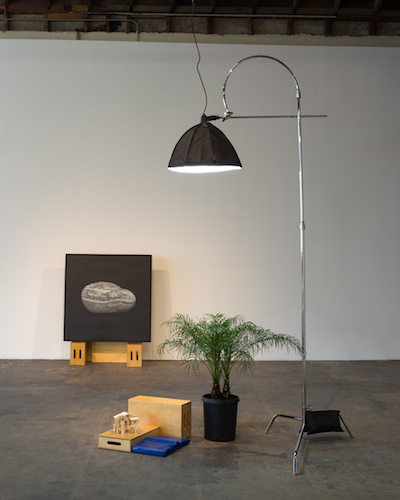 Other sculptures including minerals and a miniature mill illustrate the narrators’ stated interests, and seem to suggest a therapeutic utility—which the artist’s recontextualization subverts, somehow compromises, yet to which Tribe’s art aspires.